The terror attacks on London's transport network have led to travel chaos across the South of England. The region's transport network has been hit hard, with a number of stations closed after Thursday's bombings. In Southampton, an area of the city around the main coach station was cordoned off by police after a suspect suitcase was found. Portsmouth Harbour, Basingstoke and Poole train stations later reopened, as well as Gosport ferry port. They had been closed after suspicious packages were found. Many services from the West Country were forced to terminate in Reading and Slough in Berkshire. Stagecoach and Megabus services to the capital from towns and cities in the South resumed after being suspended for part of Thursday. National Express coaches to London were only travelling as far as Heathrow. 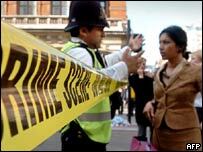 Dorset Police said they were stepping up security and intelligence gathering at stations and ports, as well as vigilance over possible attacks on the Muslim community in the wake of the bombings. Adrian Whiting, assistant chief constable of Dorset police, said: "Dorset Police is committed to working closely with all communities in the county - especially the Muslim community - to make sure that they are not targeted as a result of (the) bomb attacks in London. "Such targeting will not be tolerated by Dorset Police." Hampshire Constabulary also said it was increasing patrols around railway stations, airports, coach stations and other key transport locations. Chief Constable Paul Kernaghan said: "We have no information to suggest that there is going to be an incident in Hampshire or the Isle of Wight. However, you would expect us to be prepared and on standby to deal with any eventuality." All rail companies were urging passengers not to try to travel into London. A spokeswoman for South West Trains said: "We want to get trains into London so we can get people out." Ambulances from the Royal Berkshire Ambulance Services have been despatched to London and the county is now being covered by the Wiltshire service.